Your online cyber security degree puts you in demand. Society’s dependence on devices and accessibility has led to large-scale cyber attacks — the more connected you are, the more vulnerable your data becomes. In fact, a survey of more than 4,100 organizations found that 7 out of 10 were not prepared for a cyber attack. * It’s not because businesses can’t detect hackers; it’s because they don’t have the talent to defend against them. And that’s why the industry needs you. 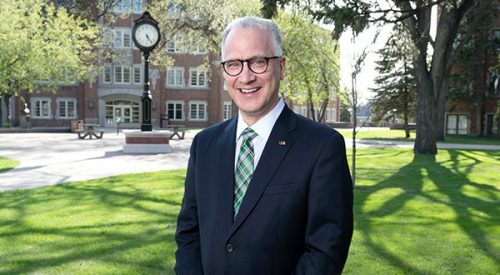 Why choose UND’s Master of Science in Cyber Security? Our online master’s in cyber security program is offered through the College of Engineering & Mines (CEM) — one of the most well-respected engineering schools in the upper Midwest. That means when it comes to quality, you can be confident in UND. What can you do with your M.S. in Cyber Security? Do more than detect cyber crime. Defend against it. Our master’s program allows you to complete general coursework or specialize in one of three areas that can prepare you for leadership in the growing field of cyber security. Study topics ranging from advanced embedded systems design to insider threat analysis and refine your expertise. Since our program is housed within the College of Engineering & Mines, you can be confident that the technical knowledge you’re developing is the highest quality. It’s critical to secure machines driven by artificial intelligence so we know they can be trusted to perform as designed. This track can help you understand the basics of autonomous systems, security challenges and possible solutions so you can design secure autonomous systems. Society relies on simpler and stronger connectivity from one device to another. This track addresses the behavioral aspects of cyber security — insider threat analysis, social engineering and other human factors that exacerbate or mitigate cyber security risks. How your organization safeguards information from unauthorized users is important. In this track, you’ll learn computing methods to prevent intrusion and unauthorized access to computers through encryption, tokenization and key management practices. Demand for expert cyber security professionals in all industries is on the rise, which means you need to be qualified and diverse. Focus your coursework on autonomous systems, data security and behavior to strengthen your interdisciplinary knowledge. Do more than learn from our expertise. Build your own. Our 25:1 student-faculty ratio means you can work closely with experts in the field and graduate equipped with the insights to lead and the tools to make a tangible impact.